SMS marketing is a new and successful way that is introduced by businesses for their growth and expansion. A reliable SMS marketing company can take the business to another level. It is the work of professional companies that know how to deal with the message technicalities to deliver it to the right target audience. Their main focus is to make the message content better to increase customer engagement. 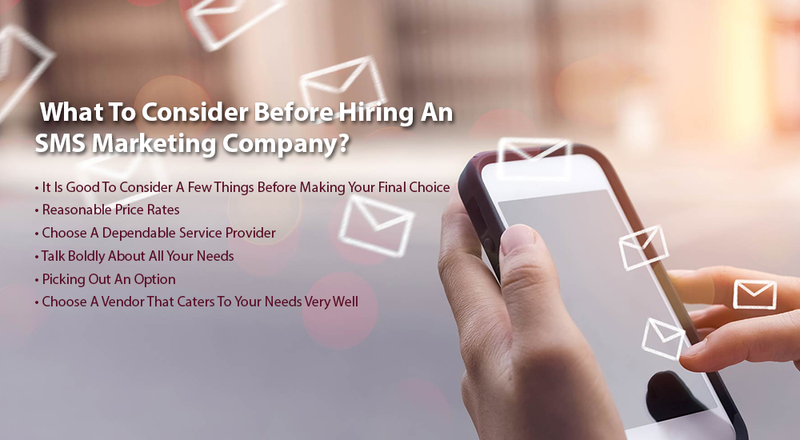 What To Consider Before Hiring An SMS Marketing Company? In today's competitive world there are many companies that offer SMS marketing services. They work on their own variables and offer many business-friendly services that help them to earn potential customers. They work to get an effective database, composing an informative message, timely delivery etc are services offered by SMS providers to their clients. It Is Good To Consider A Few Things Before Making Your Final Choice. Reasonable Price Rates: It is efficient to conduct proper research before making your decision. As the demand for the SMS marketing services is continuously rising, the providers are likely to sell their services at increased rates. Do not choose the company in the hope of quality services at a high price. Be conclusive and select the company offering reasonable rates. Choose A Dependable Service Provider: After considering the price, be more specific and choose a dependable service provider to make sure that you will get dependable services from the company as a backup. Talk Boldly About All Your Needs: Be clear about what services you want from the SMS marketing service provider. It is good to tell your futuristic goals and potential needs to the company to get efficient results. Also, ask a lot of questions and also their views about your business and what services would seem to be beneficial to them. It is good to mix and match your suggestions. Picking Out An Option: Do not rely on just one provider. Widen your search and shortlist a few companies according to your needs. Take your time and pick the most suitable option. Choose A Vendor That Caters To Your Needs Very Well: It would be profitable to choose a vendor that is willing to support you promptly and also provide post-service help.